We would just like to take this opportunity to thank Cornel and the team from Great Bear Log Homes for the fantastic job that they have done on our house. We had been looking for a holiday house to suit our needs and wishes however after many months searching without finding what we wanted we decided to purchase land (180 acres) and build our own dream place. As our land was a large bush block we wanted something that fitted in with the character of the property and a log home was our first idea. Thanks to the internet we found Great Bear log homes and started making enquiries. Every time we arrive at our property the impressive sight of the house never fails to make a huge impact on us. Looking at the attention to detail that was put into the logs by the Great Bear team still amazes us. We are taking our time with the fit out to ensure that it lives up to the same high standard as the log structure. Our plan was always to ensure that this house was an awesome and unique sight now and forever. We are pleased that Cornel and his team have a real passion for what they do and take 100% care at every stage of the project. We would like to write a testimonial for Cornel and Louis of Great Bear Log Homes. In 2002, we were looking to buy a property in the Alpine region of the high country and came across one of three log cabins already built by Great Bear Log Homes in Sawmill Settlement, Victoria. We were so impressed with the construction method and uniqueness of the homes that we went on to buy one that was on the market at the time. We owned that home for 4 years and enjoyed so much the pleasant environment the logs provided which was warm and well insulated in winter and cool in the summer heat, especially on the lower level. With an expanding family and changing needs, we decided to sell this home and re-build another home in the district. In early 2006, we found an amazing piece of land on Alpine Ridge with magnificent views towards Mt Buller and the surrounding area. Immediately we thought how wonderful this location would be to build a new home and if we could afford it, own another home built by Great Bear Log Homes. We immediately contacted Louis and Cornel and set about possible designs and construction ideas for the site, without an architect. Cornel is a very skilled designer using AutoCad and was able to provide detailed drawings and plans for us right from the start. After an initial rejection by council on our first design due to a building envelope restriction, Cornel was fast to work with us to design a new floor plate and structure that was subsequently passed by council and soon thereafter built in the Mansfield log yard. The Log structure was built according to plan and almost to the exact timeline set out by the Great Bear team. Cornel and Louis introduced us to the preferred local builder, Travis Purcell who set about construction of the home foundations and basement, then eventually the fit out of the interior and completion of the exterior. IN addition to the Great Bear team, Travis also did an amazing job on the project and we highly recommend Travis for similar or related projects. 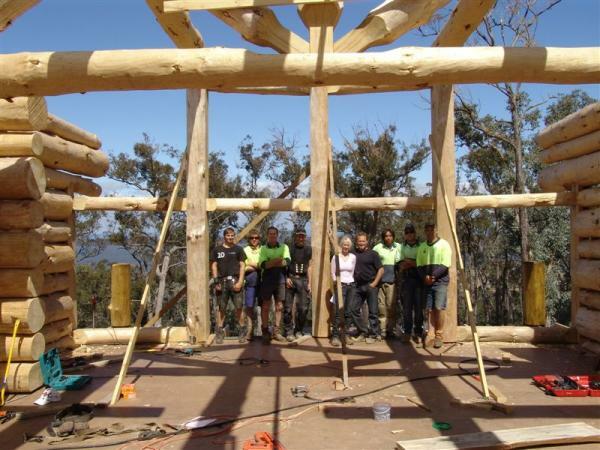 The harvesting and construction of the log structure commenced in November 2006 and was completed and delivered to the building site by May 2007. Meanwhile the slab for at the home site was laid in February 2007 and subsequently the lower floor was constructed and ready to receive the log shell in May. The home was eventually completed after 1 year, by November 2008 only slightly behind schedule. Our key principles in building the log home were ‘build it once, build it right the first time and keep the home in the family forever’. We are so pleased with the result and the house is absolutely amazing. Cornel was great to work with throughout the design phase – he was very patient and able to take our design ideas and make them a reality in the Eagle Ridge home design. The construction of the log shell is incredible and I know and you can even see how great detail was taken in the selection of the individual logs and the placement of the logs throughout the home for effect. 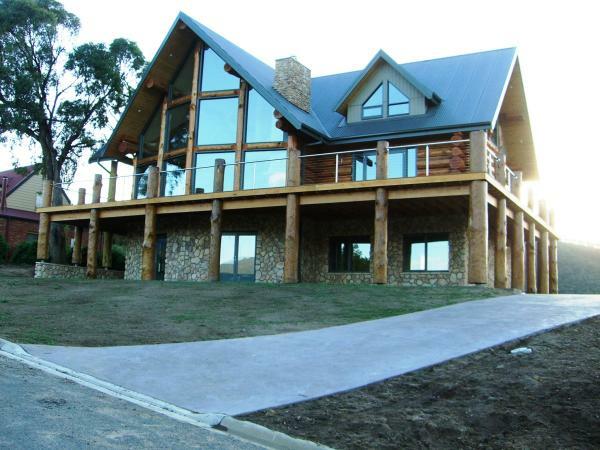 When you add together the unique features of a log home, the great design and construction work done by the Great Bear Team, a builder like Travis Purcell with the highest standards and an amazing location like the Victorian High Country, the result is almost indescribable. We are very thankful for the craftsmanship and passion of our builders and recommend them to anyone that wants a very unique home that is built to last. Log homes built by these Master Craftsmen are not cheap but are worth every cent when you finally have your time to rest and appreciate your new home. Thanks again, Cornel and Louis (Great Bear Log Homes), Travis Purcell (Builder), Billy Mahoney (Electrician) and all the skilled trades people who made our dream a reality. Without the help of an architect or a project manager Lee and I bit the bullet and engaged a couple of energetic Aussie Dutchmen and their Great Bear Log Homes team from Mansfield to design and construct a home for us in North-East Victoria. What a ride it was - and at the end of the day we are in a house which, thanks to the Great Bear Log Homes team and all the other trades people involved, has exceeded our expectations! Despite the many meetings we had to discuss the project we can honestly say that we did not fully understand the craftsmanship involved in putting together our little gem. We were particularly pleased with the calmness, the care and the attention to detail that you both brought to the project. You accommodated and encouraged our desire to incorporate into the design a variety of Victorian, Edwardian and Art Deco windows and doors internally and externally and an imported Italian tiled roof without batting an eye. We have no doubt these features have enhanced what was already a fantastic design. As one keen observer said on introducing himself – “so you are the people who put up that awesome machine on the hill”. 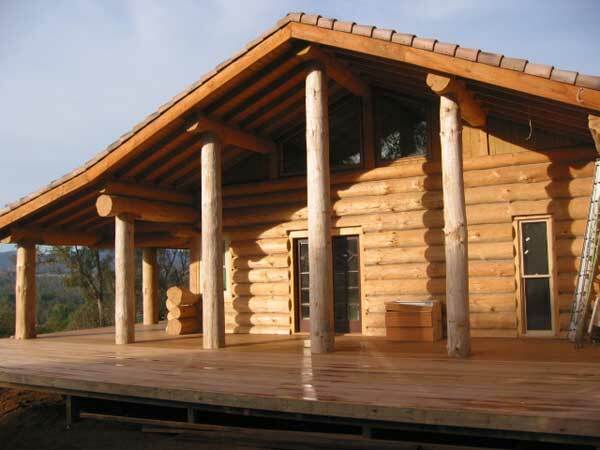 We wish to offer the highest of accolades for the expert log home building skills of Great Bear Log Homes. We had to wait a little longer than expected - but you simply cannot rush PERFECTION! Their work is of the highest quality possible and most important of all is that they are true to their word. They stand by their work and are professional in every respect. Their craftsmanship was better than we had ever imagined. Not only did we get an extraordinarily beautiful home, but all the people we worked with from Great Bear Log Homes were caring, knowledgeable, patient and friendly. The personal attention to detail - from the architectural service for our custom design, to the ordering and construction updates, to the first-rate assistance on site —Great Bear Log Homes are second to none. 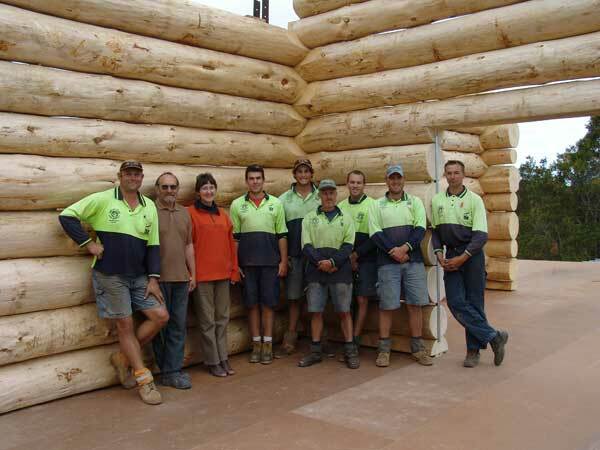 We would highly recommend them to anyone who wants a quality authentic log home. 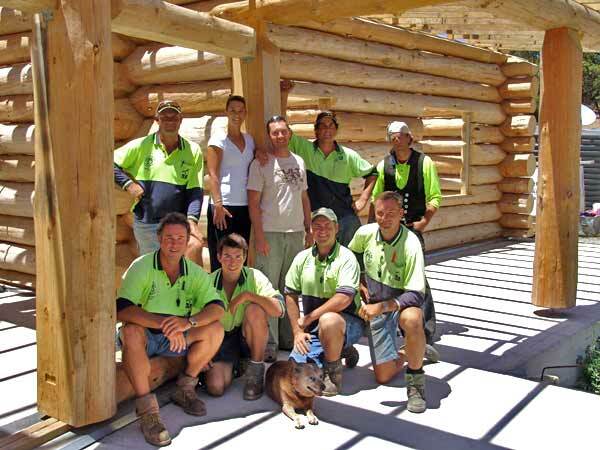 A few years ago we were keen to build a log home and Great Bear were recommended to us. As our plans involved a large number of windows we felt that it would be a shame to have to cut out such large portions of the exterior walls, so we took the somewhat unusual course and decided to build our home with the main interior walls of log. The guys hadn’t actually done this before, but didn’t hesitate to take on the challenge. Another first was that they used larger logs than they have ever used before. As it is a large house, the big logs suited it perfectly, so that the “scale” is right. We were very impressed with the craftsmanship of Great Bear and the guys worked very well together as a team, and it all went in like clockwork. It was all very exciting to see the log truck coming up the road to our place and up our (rather steep) driveway. They arrived at night and it was foggy next morning, so it was a bit eerie waking up to see a massive truck full of beautifully smooth logs of different shapes and sizes. Our house isn’t quite completed yet, but the other main components have fitted in perfectly and we are very happy with the result. Cornel & Louis are very professional and we would have no hesitation recommending their company to build your dream home.